In February 2008 crew training started for the Wrexham, Shropshire & Marylebone Railway. 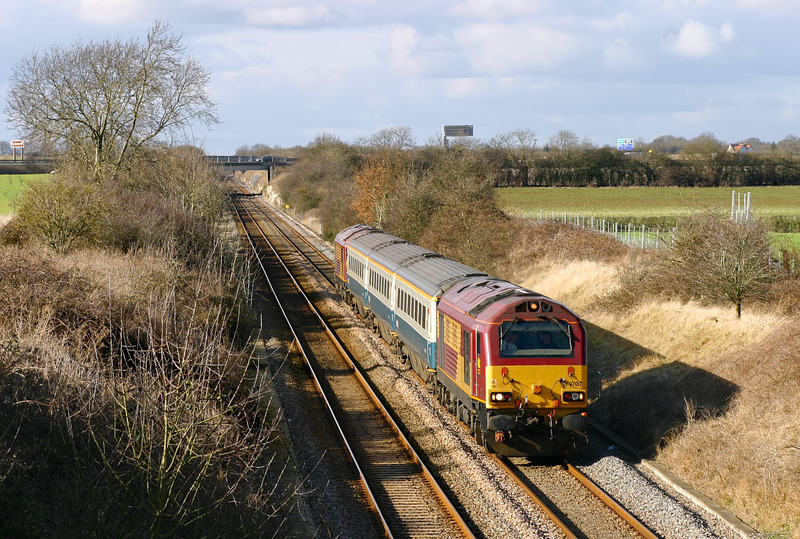 The 5Z23 14:01 Banbury to Marylebone is pictured passing Bucknell in brilliant late winter sunshine on 27 February 2008, with 67017 Arrow leading and 67016 at the rear of the 3 coach Cargo-D Mk3 First Class rake. My preferred location for this picture was a few miles up the line at Fritwell, but reconnaissance a few weeks earlier had indicated that the shadows would extend right up to the running line, and if the train had only been slightly late would have led to very difficult lighting. In the event it was a good decision to choose this spot, as it was completely sunny all the time, despite there being a huge bank of cloud just to the north and a similar one to the south!